is there a post on measuring for this system? Funnily, I think there isn't! But for the proportionate draft you need just the basic ones: height, chest, waist and hips. Everything else is calculated with the formulas using fractions + ease. This thread has been updated! Additions have been made to the 1966 draft in the second post. This is one of the best article here. Which Rundschau number is this? Die Armlochtiefe und die Achselstellung des Vorderteils very important, lapel dart and front neck point tip. The article is a continuation of the Muellerbook #17. I wonder how the lapel dart disturbs the design. I cannot see it on my coat. They say is not recommended cause it could disturb the design. I have looked everywhere, but can't find it though I am sure I saw it somewhere on the forum, so I'll ask here: how do I figure the placement of the gorge line at h3? Also the button placement? ...how do I figure the placement of the gorge line at h3? 1/6 scale is general for some. The diagonal from H2 to n is about 3/4 inch. But these can be done anyway you want, and some leave extra cloth so they can fine tune the look at the fitting, not to mention this is in the style and fashion department of tailoring. I was told as a small boy the waist button is placed about 5/8 inch below the waist. But it can be put anywhere. Some start an inch above and some an inch below, or anywhwere inbetween. And from one coat to another you may want some higher or lower to what you decide is normal. And the other buttons are measure up and down from the waist button. And the collar needs to be adjusted according to the roll of the lapels- high, low, wide or flat. Alot of this can be decided at the fitting where you get to experiment quickly with pins. One canvas to another can have different results as the method of making up the canvas. Waiting for the fitting will show what you have and where best to put buttons and adjust the collar and even how to shape the curve of the lapel. The curve of the lapel I like mostly towards the bottom, starting at the bottom. If you put a lot of curve in at the bottom of the lapel then the stripes will run off- nothing wrong with that. With a pin fitting you can adjust the runs with every other part of the coat and overall the whole body. A good pattern system produces a good general looking pattern. But if your chest is bigger or smaller, shoulders wider or narrower and so on it changes the 3-D veiw, so a pin fit gives opportunity to adjust per-person. None of this is to worry about, but something to think about and experiment with. Thanks for the insight greger. I drafted the gorge rather high so that I can do just what you suggested greger. I will tweak the button placement, roll line, and lapel and gorge when I cut it after my cloth comes in. Amateursarto, on heavier people the button stance is generally even lower. The mtoc gives advice on what it could be. Some I-Gents have shown the button placements up and down, where ever, where I don't think they should be, because it didn't help the persons looks. Even heigths of waistlines can be a fad, so the art isn't about good looks all the time, but sometimes something else. Sometimes it isn't even art, just a dumb fad. The narrow lapels of the early 60s is not the same as the narrow lapels of today, because the kids today wouldn't really know the "talk" (art) of the past because they were born several decades later. The appearance can look the same but not be the same because the "talk", reasons, would be different and there shape is derived from the "talk". If your mind is in a different relm, then you should make accordingly. Therefore, all points are moviable to meet the dreams of the wearer. Static clothes are not art because they have no passions and reasons for the passions. General rules usually produce an OK coat, but they don't take into account many other dimensions. When you stand in front of the mirror and pin the coat closed, pin being where the button might go, you may think it should be lower or higher and repin until you find the perfect location. Also, if the roll line is not fixed, you can adjust that, too. What shape the roll is and then the outline of the edge can also be detrimined during the fitting. When these are decided you can add the haircloth and tape the bridle. You can really hand-shape a really cool coat. The next coat developes some other pleasures of thought to be hand-shaped. And, so it goes, from coat to coat, none of them the same. Whatever catches your fancy. 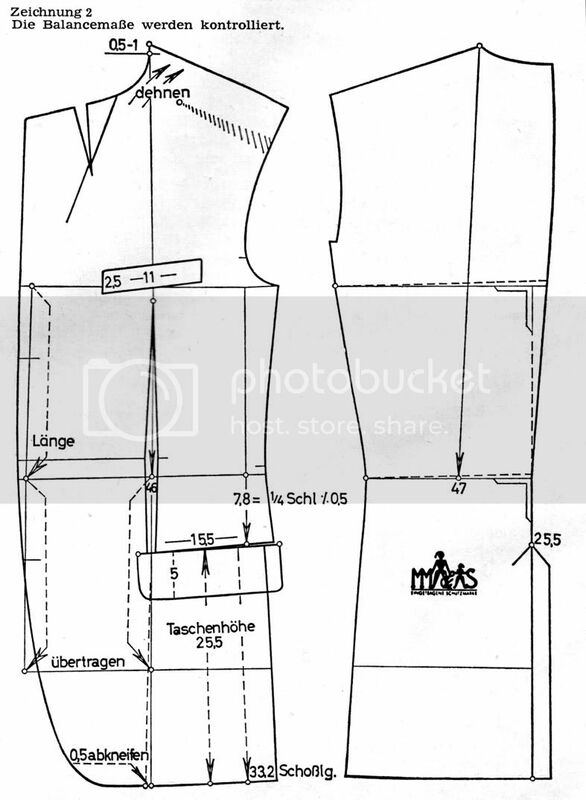 The most correct coat draft that I have seen so far where I only found one tiny mistake is the draft of Max Dietl in Rundschau 7-8/2003. You can order the Rundschau for 10.20Euro + shipping in Ebener Verlag. The tiny mistake is that he should tilt the back not 1cm but 0.5cm otherwise the balance is disturbed of 5mm which would not be a big deal. Even the sleeve cap is correct. Dreiteilung and bodily ease complete correct. Ueberschulter is 1.5cm too long as in every Rundschaudraft but will be fixed with fitting. Don't dare to break the copyright with this draft in public! Edited by zokiTzar, 09 June 2012 - 01:35 AM. The difference between these two measures should be such that (1) is 1cm shorter than 2. The front balance is 1 cm longer than the back. In this example (1) = 46 cm and (2) = 47 cm. This is what you say and it is correct. I´m sorry but we do not have such old issues. You can take a look at our website. There you can see all issues that are available. I have struggled terrible with those people to get an old issue shipped for 20$. If you share expenses I could send you a copy. Thank you. Very kind of you, apparently the book meisterschnider from rundschau has the draft that is avaliable on there website so I might consider buying it, although not sure how much use it would be to a non German speaker. Because it's also meant to be a very informative book and very good in content. Although I have some very nice German colleges at work so they could always lend a hand. The book Meisterschneider has good content, all copied out of the Rundschau magazines. But after seeing those articles I use none of them, only parts of ideas are interesting. So its worth looking at the book and maybe having the book but not using much of it. And then there is the German language barrier.